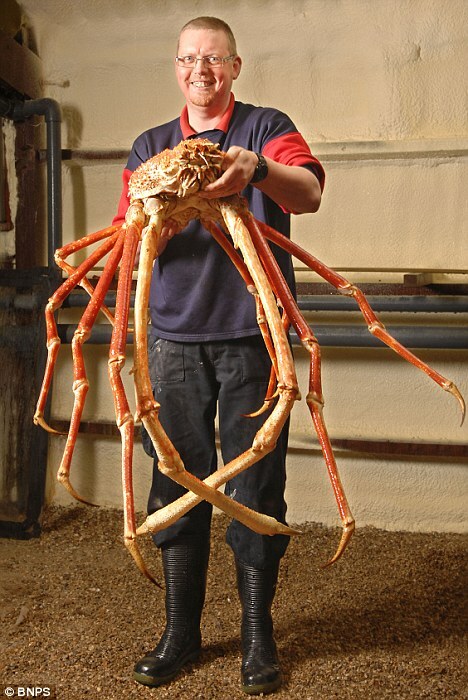 Named after Godzilla’s nemesis, ‘Crabzilla’ is a Japanese Spider Crab, Macrocheira kaempferi. It is reported that this arthropod measures 10 feet from claw to claw. Crabzilla could grow to be 15 feet and live to be 100 years old. This little fella was caught by fishermen in the Pacific Ocean and taken to it’s new home at the National Sea Life Centre in Birmingham. Crabzilla normally spends his days as much as 2,500 ft below on the ocean floor. The Spider Crab is considered a Japanese delicacy. Luckily Crabzilla has been spared the hot water and will soon be flown to Belgium where he will live out his remaining 50+ years in a specially adapted tank to be on display at a Sea Life center in Blankenberge. Amazing Video – Sea Snake attempts to eat an eel. I jsut saw one of those alive at the FL Aquarium last week almost thought it was fake till it moved i was like WHOA wheres the butter.